Bilge Pump Work | THERMO Spoken Here! In a small boat during a storm a man operates its manual bilge (see schematic). Raised by hand, the piston of the pump "lifts water from the boat bilge then dumps it into the bay. Given the information provided by the sketch. Calculate the least work required of the man per stroke of the pump. ♦ The man applies a force to the piston rod to lift it and the water above and below it. The sketch shows the rod (with the force of the hand applied) in its bottom position, (1), and upon being lifted; in its top position, (2). This is an increment type process. We write the energy equation to assist system selection. We seek the work written in the above equation. There are two manners of calculation of this work. One manner (System Analysis) is to select an appropriate system and evaluate the energy terms left-of-equality. The second method (Force-Displacement Integration) is to specify the forces that act on the piston and integrate them over the piston displacement. System Analysis: Let the system be the piston, piston rod and the water that "is pumped" with each lift of the piston. 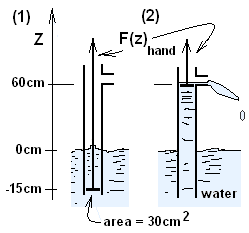 The sketches show that water on top of the piston ("above") and water below it ("below") are moved. We write the energy equation for those water masses in difference form. There is only one source of work, the man. In the above equation, the initial kinetic energy of water "above" and "below" is assumed zero. Were the boat sinking, it is likely that water would be expelled from the pump with considerable kinetic energy (KE2). A simpler case, in which the second kinetic energy is assumed small (and ignored) provides the academic answer: "least theoretical work." We assume negligible kinetic energy changes. The initial and final states of the water with approximate elevations of their centers of mass are notated in the sketches below. The left panel of the sketch shows states of the "water above" the piston. The initial elevation of its center of mass is 1A. That water flows from the pump at the elevation (2A). The right panel of sketch follows the "water below" of our event. 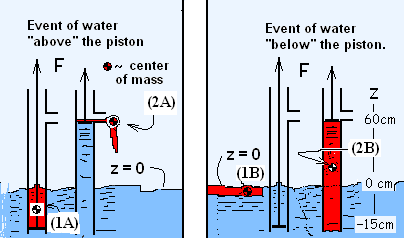 The initial elevation of its center of mass is: Z = 0 (at the surface, (1B) of the bilge water). The pump stroke brings the center of mass of "water below," up into the pump housing beneath the piston to a second elevation of (2B). Changes of potential energy of the masses per upward stroke equal the mass times gravity times elevation change. The individual masses equal the density of water times their volumes. In the drawing, initial and final elevations of the centers of mass are specified. The water free surface is taken as zero elevation. The above calculation gives the work by System Analysis of the water involved. Force-Displacement Integration To integrate the force exerted by the hand through its displacement, a force-displacement diagram must be constructed. With the piston as system, the momentum equation is applied with very slow, near zero velocities. 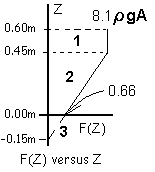 At selected elevations, the force required of the hand, F(z), is determined, graphed versus the vertical displacement, z, then integrated. The sketch below shows four elevations of the piston as it is lifted. Right-most in the sketch is a brief free-body-diagram of the piston and its acting forces. The mass of the piston is assume negligibly small. The table beneath the sketch presents calculations for the lifting force applied to the piston at each of its positions (i.e., elevations, z). Next a sketch of F (abscissa) versus z (elevation) as the ordinate is drawn. The integration of hand force through its displacement is the area bounded by the ordinate and the function F(z). The work equals the area (1) plus the area (2) minus area (3). We have calculated "both sides" of an event. We assumed what are called, "quasi-static" conditions. This meant "change for which the energy required is the least." The answers are the same, as they must be - given our assumption.